Three floors high. Measures 18"wide x 30" long x 36" high. 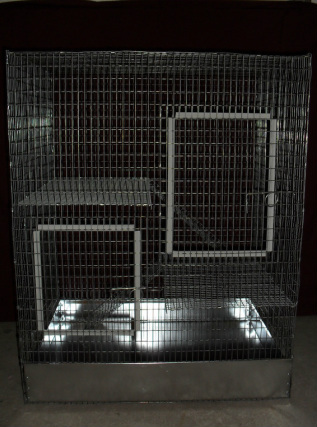 Has a pull out chew proof 3 1/2" high metal tray on the first floor and the 2nd and 3rd floor is 1/2x1/2 wire. Ramps go up to the 2nd and 3rd floor. Cage has 1/2 x 1 wire spacing. Would be suitable for a ferret, chinchilla, rat, etc. Don't want your furry friend on the wire floor shelves? Upgrade to pull out trays on all levels for an extra $20. and ramp going up to the 2nd floor. Cage has 1/2 x 1 wire spacing. Townhouse "A" Measures 24"wide x 24" long x 24" high. Townhouse "B" Measures 18"wide x 30" long x 24" high. Don't want your furry friend on the wire floor on the second level? Upgrade to pull out tray for the second level for $12. 1 1/2 floors high. Has a pull out chew proof 3" high metal tray on the first floor and the 2nd (1/2) floor is 1/2x1/2 wire. Measures 18"wide x 30" long x 18" high. Don't want your furry friend on the wire floor on the shelf? Upgrade to pull out tray for the second level for $10. DO YOU LIKE THE STYLE BUT WANT A DIFFERENT SIZE? CONTACT US WITH YOUR DIMENSIONS AND WE WILL GIVE YOU A QUOTE. Metal on all sides except front. Metal wire guard on edges. Individual doors on top. Carry handles on sides. Removable tray for easy cleaning. Each compartment 8 x 11 x 10"h.